The Topkapı Palace (Turkish: Topkapı Sarayı) is a palace in Istanbul, Turkey, which was the official and primary residence in the city of the Ottoman Sultans for 400 years of their 624-year reign, from 1465 to 1856. 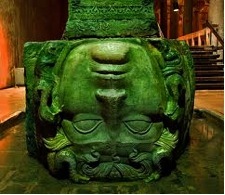 The Basilica Cistern (Turkish: Yerebatan Sarayı - "Sunken Palace", or Yerebatan Sarnıcı - "Sunken Cistern"), is the largest of several hundred ancient cisterns that lie beneath the city of Istanbul , Turkey. 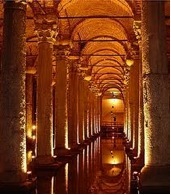 The cistern, located 500 feet (150 m) southwest of the Hagia Sophia on the historical peninsula of Sarayburnu, was built in the 6th century during the reign of Byzantine Emperor Justinian I. The island that the Maiden’s Tower is located on was just a small mull from Asian shores and it drifted apart forming the present image of the island. This unique tower with a history dating back to 2500 years, has eye - witnessed everything that the city has encountered throughout the history. 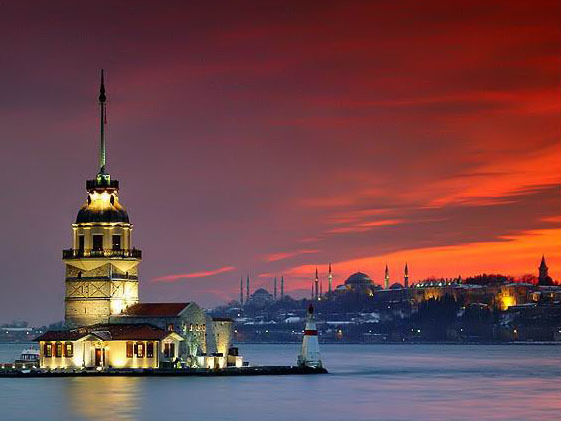 This tower has been erected during the ancient age and constructed by renovations from the ages of the Ancient Rome, the Byzantine Empire, and the Ottoman Empire, the tower has reached to present time with its mysterious appearance.